We've always wanted to pet a skunk. They're so cute with their black fur and white stripe running down their backs. Skunks look so soft too. We'd like to bury our faces in one or give one a great big hug, except for one pretty big problem: they're stinky little guys. Poor skunks, they don't mean to be smelly. Wait, actually yes they do. They're able to control their stink so getting close to one is pretty difficult. When threatened, they emit a stink bomb. 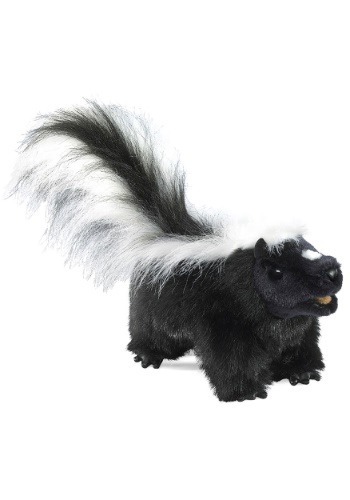 It's a pretty cool ability; no wonder why kids love skunks! The Folkmanis skunk puppet brings the zoo to you! It's ideal for puppet shows or just good, old-fashion cuddling. It'll become the perfect companion for your little one. Get ready to see many performances starring the skunk puppet! The Folkmanis skunk puppet is approximately 15 inches long and covered in soft black and white fur. The skunk's interior pouch is where kids put their hands to make the skunk's mouth and front feet move. It's ideal for ages 3 and above. Kids love creating puppet shows with all their Folkmanis friends. Add the fluffy cat, frog, and bunny puppets to cart so your little one can put on a dramatic performance!